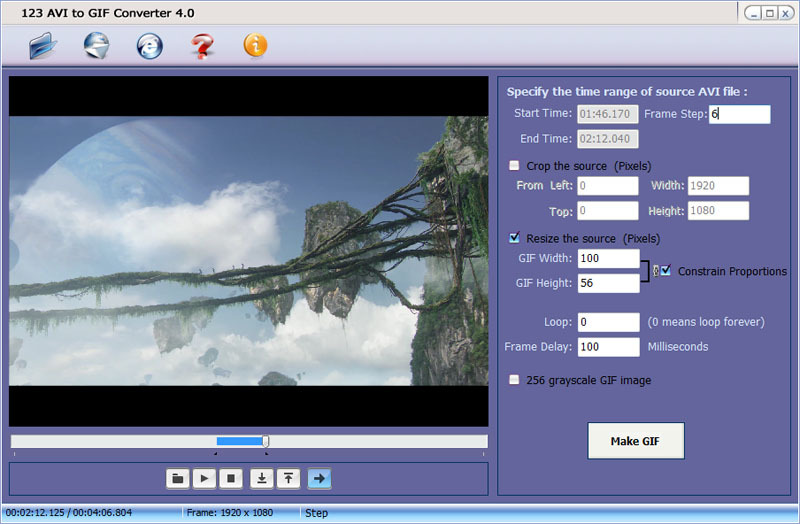 - A Windows software to easily convert video to animated GIF images. What is 123 AVI to GIF Converter? Convert most of popular video formats to animated GIF image. Easy to use - With the totally redesigned interface you can finish your works more easily and efficiently. Convert video clips to user-defined GIF animation. Crop and resize the source image to make appropriate size GIF images. Compatible with Windows 2000, XP, 2003, Vista, and Windows 7. Support most of popular video formats. Fixed the bug that can't making greyscale GIF image. Redesigned the main software interface, some minor bugs fixed. Add the ability of convert GIF to AVI. The first release. Convert AVI clips to GIF. Compatible with Windows 7, Vista, Windows 2008, XP, Windows 2000.